← Biggest False Flag Operation Since 9/11 Happening Right Now! As the nation’s top-ranking law enforcement officer, former FBI Director James Comey is held to the highest standards of compliance with the United States Code. How could he not be given his statutory obligation to enforce federal law nationwide? Nevertheless, while discharging his official duties, Director Comey chose to embark on an unparalleled crime wave the likes of which has never been seen before during prime time. What follows are only the more obvious crimes that he committed; certainly, there were many more which were perpetrated under the cover of his high office. Not only did Director Comey have irrefutable proof of Hillary Clinton’s transgressions of various federal statutes, it appears that he abetted her criminal activity. This makes his felonious crimes against “The People” much more serious. There is perhaps no more graphic example in U.S. history of a senior law enforcement officer publicly ignoring and deliberately covering up a crime spree committed by a cabinet-level appointee than FBI Director Comey’s. That Comey had access to considerably more evidence of criminal activity makes his willful neglect all the indictable. His own behavior easily rises to the level of obstruction of justice and official misconduct. 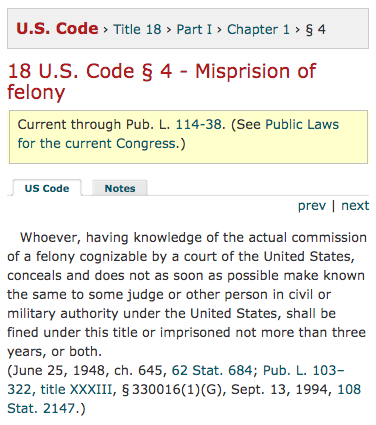 Again, the U.S. Code is very clear in regard to “Misprision of felony”. According to Comey’s own testimony before the Senate Intelligence Committee, he intentionally leaked classified information to his personal friend at Columbia Law School. His own admission serves as legal evidence of conveying governmental records without proper authority. It is now quite apparent that he committed this crime in retaliation for being ignominiously terminated. 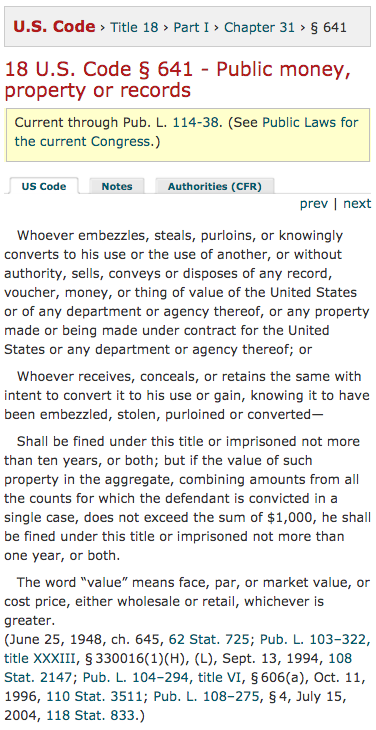 Again, the U.S. Code is very clear in regard to “Public money, property or records”. While the crime of perjury is often difficult to prove, because of the extremely privileged position that Comey had as Director of the F.B.I., he knew virtually everything anyone in government could know about Emailgate and the Clinton Foundation crime wave. As a matter of fact, the FBI crime files are full of hard evidence which point to a highly organized international crime syndicate run by the Clinton Foundation. There are actually several instances where Comey has committed perjury over the past year. A close reading and comparative analysis of his various public testimonies reveal outright contradictions and numerous prevarications. Any experienced prosecutor would have a field day with so many documented instances of perjury committed during live broadcasts before Congress. 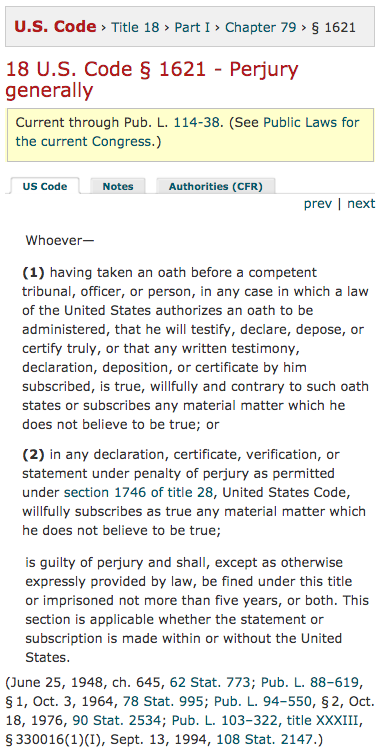 Once again, the U.S. Code is quite clear in regard to Perjury. 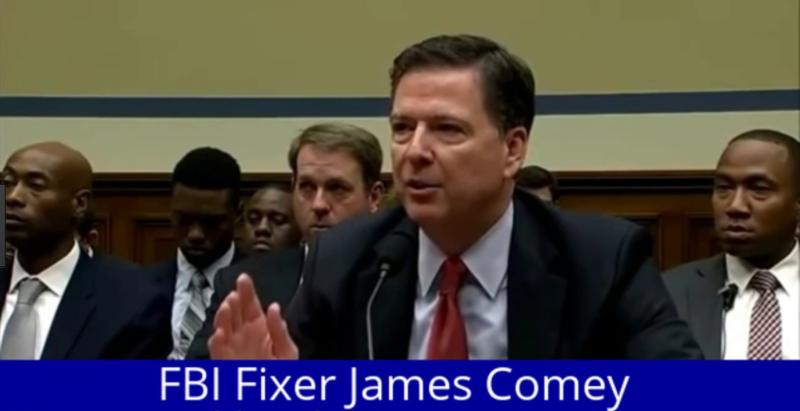 This legal examination only scratches the surface of what appears to be a multi-decade criminal conspiracy to deceive and defraud the American people by James B. Comey. For a much more detailed treatment of the James B. Comey criminal investigation, please see the following definitive exposé. For those looking to understand the hidden back story as to what president Trump has really done concerning Comey’s delinquency and insubordination, the link below lays it all bare. Dropping the Hammer on Comey…Brilliant! As the previous investigator so aptly stated, “Happy Hunting, President Trump!” Draining the swamp surely begins right inside the Beltway; after all, Washington, D.C. was said to have been built on swampland.